The Protected content closes on 4.2. for renovation. Free admission for all art and culture lovers. TheProtected content is a group of museums in Vienna consisting of the museums of the history of the city. In addition to the main building in Karlsplatz and the Hermesvilla, the group includes numerous specialised museums, musicians' residences and archaeological excavations. 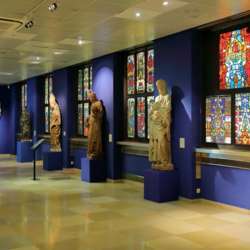 The permanent exhibit of art and the historical collection on the history of Vienna include exhibits dating from the Neolithic to the mid-20th century. The emphasis is on the 19th century, for example works by Gustav Klimt. In addition, the Vienna Museum hosts a variety of special exhibitions. Concert: 3.2. during the exibitions to 7 pm - Musicbanda Franui & die Strottern. After the exhibition we go for a drink! Be polite and cancle, if you are not attending.